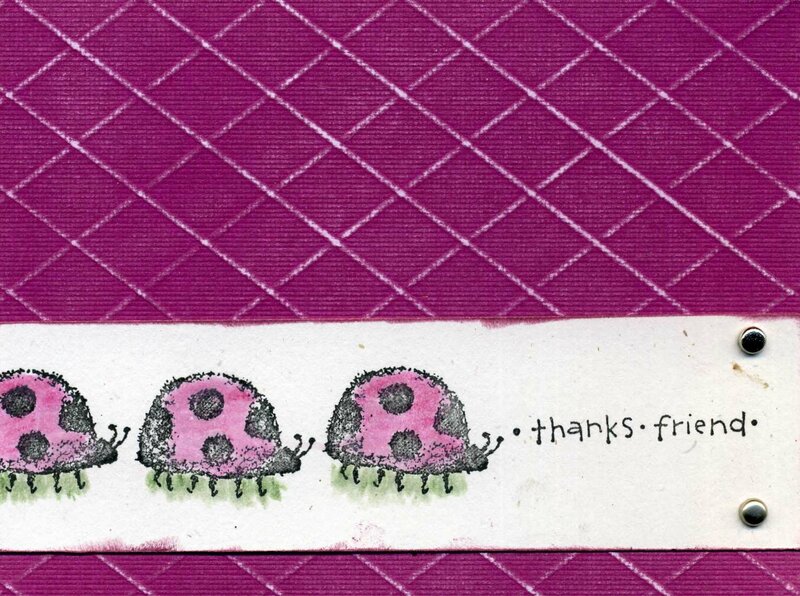 HandmadeBits4U: Squiggle LadyBugs and the ScorPal! Squiggle LadyBugs and the ScorPal! What do you get when you mix LadyBugs with the ScorPal, some white core stock paper, and a little bit of ink and aqua color crayons? Well, you get a LadyBug Card!! This is one of the cards we made at my ScorPal Technique Night. The background uses the Raspberry white core paper (one of my favorites). It is cross hatched using the Scor Pal and then sanded to reveal the grid. The Squiggle Lady Bug was colored with the Tombow Marker and AquaCrayons. Ink the edges of the white strip, add a couple of brads, and adhere everything together! Its an easy and quick card to make with fantastic results!